The team behind the Fyre Music Festival produced viral video content that captured a ton of attention and drove purchase intent. But the experience fell well below expectations and, in the end, the campaign was a disaster. Here’s what your campaign can take away from Fyre Festival’s woes. The failure of the Fyre Music Festival has returned to the mainstream courtesy of the new Netflix documentary, Fyre. The story behind the creation and fallout of the scheme is remarkable on its own. But, it serves as a fundamental lesson for marketers and businesses as a whole. Our VP Enterprise and SMB Marketing, Paul Cowan, kicked off a rigorous debate on LinkedIn around this very subject. It’s through the prism of that discussion that we developed this article. Let’s dissect the viral video that launched Fyre’s marketing campaign. We’ll review how they failed to deliver on the promised experience. We’ll counter that with how Shutterstock produced a spoof of the Fyre video using its own stock footage, and how that content encourages brands to create viral videos of their own. Here is a brief description of the Fyre Music Festival marketing campaign. The festival itself was the brainchild of the now-imprisoned Billy McFarland, Founder, and CEO of Fyre Media. He hoped to drive awareness, interest, and downloads of his company’s latest development, the Fyre music booking app. In addition to the video, Fyre Media paid influencers to post a link to the video on Instagram. Among the influencers were Kendall Jenner, Bella Hadid, Emily Ratajkowski, and many others. To be fair, the influencer marketing campaign was a success. It generated awareness and hype in the festival, driving around 5,000 ticket sales, and lots of publicity for the Fyre Media brand. Followers of the models prepared for an island getaway and a thrilling beach party. Things went wrong with the follow through almost immediately. The island’s owners shut down plans to host the festival on their beaches due to the Fyre Festival video. McFarland agreed to omit any mention of the island’s past association with the famed Colombian drug lord, Pablo Escobar, in the content. He broke that agreement within the video. The caption, “once owned by Pablo Escobar,” appears in the middle of the footage. This forced the team to frantically search for a new location to host the festival. However, they continued promoting footage that promised a festival on Norman’s Cay, which was one of several misrepresentations within their content. Fyre Media was thoroughly unprepared to finance the event. They spent plenty of money producing the viral video and in support of their influencer marketing campaign. But they were wholly unprepared for the sobering reality that an event like Fyre could cost millions more than what was in their budget. Only 45 days from the launch of the festival did the team realize they needed upwards of $38 million to cover the costs. Adding insult to injury, a storm rained down on the morning of the event. The downpour flooded the tents, soaked the mattresses, and left little if any dry locations for people to sleep. The Fyre Music Festival is a perfect example of a brand that overpromised in their marketing material and underdelivered on their product. In this case, the product was the festival itself and the experience of being at the event. The promotion of the experience was leagues above what was actually delivered. These scenarios are fatal mistakes for marketers. When influencers promote content, people – especially millennials – listen. If brands promise exclusive experiences to select groups, they have to deliver on the promotion. There can’t be disconnects between promotion and delivery or it costs the brand credibility. Audiences are turned off by the brand and it’s incredibly difficult to turn that page. That’s why there’s such a premium on authentic content that depicts realistic people, settings, and products. People feel they can develop a genuine relationship with brands that are authentic. When people feel they can trust a brand, they’re far more likely to do business with it. The lesson is that, if you’re promoting an experience, ensure you can deliver on what you promise. If you produce a campaign with the potential to go viral, make sure that the product or experience you’re selling stands up to the promotion. Don’t overpromise and underdeliver. Now, Fyre Media could have saved a significant chunk of their budget had they approached their marketing campaign in a different way. In hindsight, this tactic could have even saved the festival…if the CEO of the company wasn’t so blatantly corrupt. Shutterstock created a spoof of the initial Fyre Festival video. This video, known as Fyrestock, became a viral video in and of itself. It recreated the look and feel of the Fyre Festival promotion simply by using premium stock footage. Here’s the key to this video. It cost approximately $5,000 to produce, and only one day of video production. 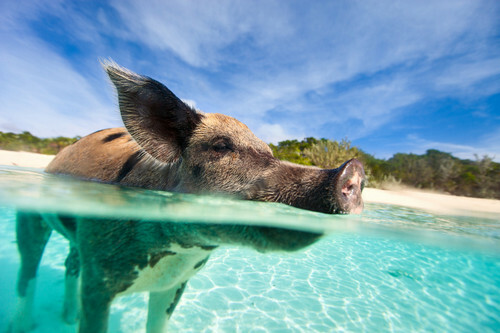 The video used 18 clips of premium footage that featured – lesser known, but still – models, exotic island locales, and even the infamous swimming pig. Music was added to the production from our PremiumBeats collections. Captions were layered on the content in post-production, which took joyous shots at the premise of Fyre Festival. It’s unknown exactly how much Fyre Media paid for their initial promotional material. But it’s a safe bet that the number is in the tens, if not hundreds of thousands of dollars. On top of that, it’s on public record they paid $250k to Kendall Jenner to create one Instagram post about the event. All of that money spent, and for what? The event couldn’t happen because there was no money to pay for it. A quick use of Shutterstock could have delivered the viral video they needed and a far more affordable promotion. The Fyrestock video is a perfect example of what’s capable with the right content and the right vision. Shutterstock opted to use the hype around the Netflix documentary to make a point. The vision was to play off the viral video that set the stage for the disaster of Fyre Festival. The content was pulled from collections of premium footage. Licensing the content and producing the video cost a mere fraction of the Fyre Media video. That’s the motivating incentive to use Shutterstock for your next marketing campaign. It’s impossible to know when something will go viral. But brands that are agile and adaptable, or that have access to pre-collected footage content, can quickly hop on a viral train. Marketers must read the trends and have content ready to go when something newsworthy breaks onto the scene. Services like Shutterstock help marketers build impressive libraries of content. This allows teams to create content at scale, and have the right asset on reserve for the moment when it’s a perfect fit. This way, if a trend goes viral, you’re ready to jump aboard. The promoters of Fyre Festival were all talk. They had no viable product to back up their promotion. On the other hand, the Fyrestock video proves the validity of Shutterstock’s footage solutions. The video clearly demonstrates the business benefits of using premium collections of content. Don’t be like Fyre Festival. Instead, be like Fyrestock and plan for your next digital marketing campaign.